Named by The Atlantic as one of the hundred most influential figures in American history, and by Time and Life magazines as one of the most influential Americans of the twentieth century, Ralph Nader has helped us drive safer cars, eat healthier food, breathe better air, drink cleaner water, and work in safer environments for more than four decades. The iconic champion of consumer rights first made headlines in 1965 with his pioneering bestseller Unsafe at Any Speed, a devastating indictment that lambasted the auto industry for producing unsafe vehicles. The book led to congressional hearings and automobile safety laws passed in 1966, including the National Traffic and Motor Vehicle Safety Act. 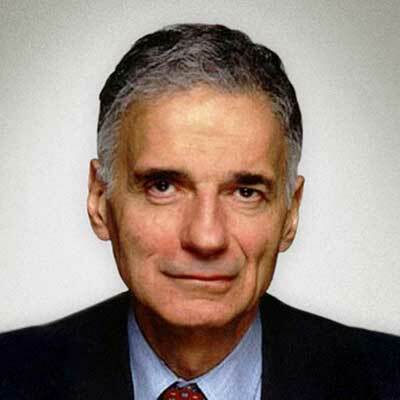 Nader was instrumental in the creation of the Occupational Safety and Health Administration, the Environmental Protection Agency, the Consumer Product Safety Commission, and the National Highway Transportation Safety Administration. By starting dozens of citizen groups, Ralph Nader has created an expectation of corporate and governmental accountability. Nader’s recent books include Unstoppable, Return to Sender, The Good Fight, and the bestseller, Seventeen Traditions. Nader writes a syndicated column, has his own radio show, and gives lectures and interviews year round.